I know, the title is a mouthful, but then again so are these bars! While perusing the local specialty food market here in town I saw a giant bin of assorted ‘gourmet’ crisp rice treat. Now, what you may not know about me is I am a complete sucker for any kind of crisp rice treat. I rarely make them because around me they are dangerous. I may have, and I can neither confirm nor deny this, eaten an entire pan all by myself. In a little over a day. Anyway, these treats came in a ton of different flavors and I eventually settled on the double chocolate chip. I unwrapped the treat, giddy with the anticipation only pure gluttony provides, and took a big bite. I knew how I wanted it to taste, and it was not even close. It was too sweet, and it had a fake butter flavor. Disappointment does not even begin to describe how let down I felt. Something had to be done. While contemplating a plan of action I remembered that the giant bin of average treats did not have any chocolate and peanut butter treats. That idea was all I needed and I set to work. 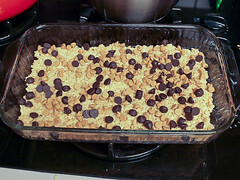 I decided, for a fun surprise, to add a layer of semi-sweet and peanut butter chips in between the two layers. This layer adds a LOT of flavor. 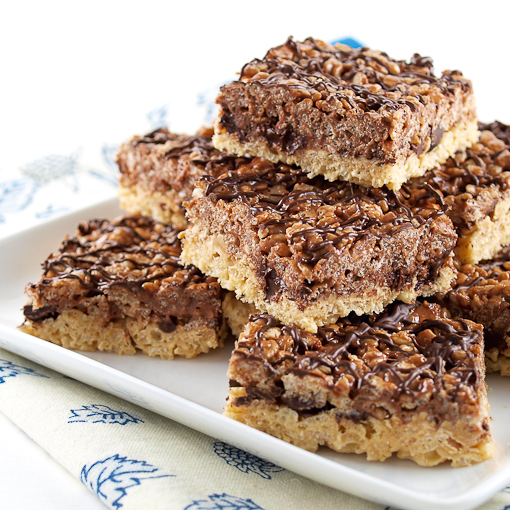 Combined with the overall richness of the bars they are quite filling and definitely satisfying. You could, if you wanted, make these all chocolate or all peanut butter, or you could fill them with different chips, or even nuts if you wanted. All that said, I am darn happy with these as they are, and I think you will be, too! Spray a 9 x 13-inch pan with non-stick cooking spray. 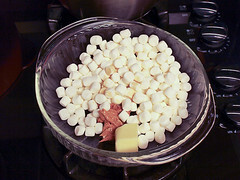 In a medium bowl combine the butter, peanut butter, vanilla, and marshmallows. Heat in the microwave for 45 seconds, then stir. If the mixture is not completely melted and smooth return to the microwave and heat for 20 second bursts until melted. Immediately add the crisp rice cereal and stir to combine. 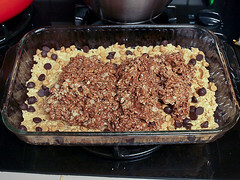 Pour the peanut butter mixture into the prepared pan and press into an even layer. Spraying your hands with non-stick cooking spray will make this easier. 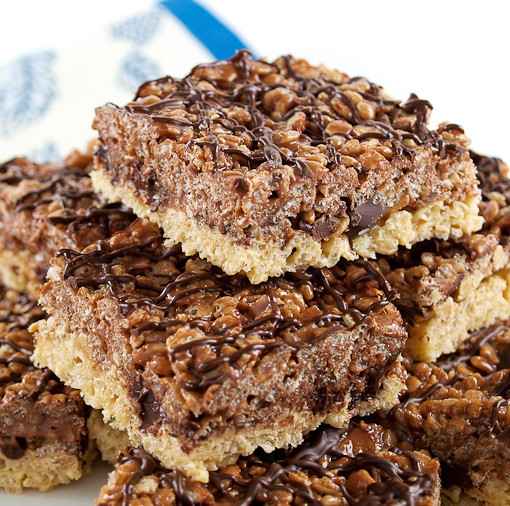 Sprinkle the chocolate and peanut butter chips evenly over the top. Set aside. 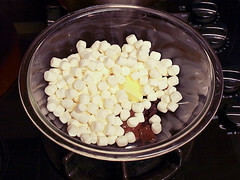 In a medium bowl combine the chocolate chips, Nutella, butter, vanilla, and marshmallows. Heat in the microwave for 45 seconds, then stir. If the mixture is not completely melted and smooth return to the microwave and heat for 20 second bursts until melted. 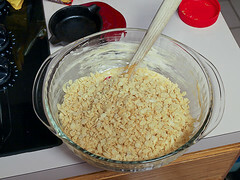 Immediately add the crisp rice cereal and stir to combine. Spread the chocolate mixture over the peanut butter mixture, pressing the mixture firmly down to adhere to the layer beneath it. Leave to cool completely to room temperature. 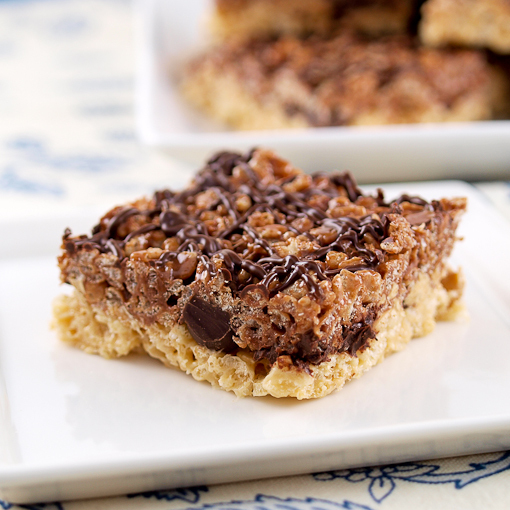 One the bars have cooled drizzle the melted chocolate over the top. 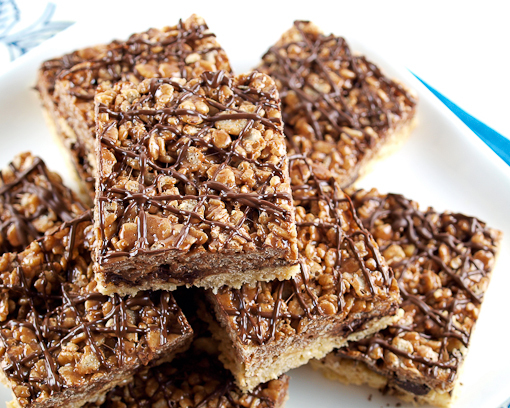 Chill the bars in the refrigerator for 20 minutes to set the chocolate drizzle before cutting into bars.